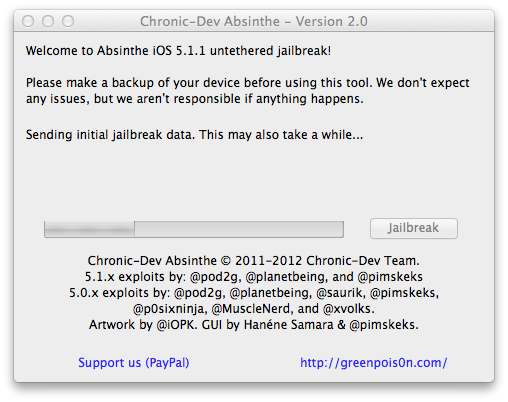 The Chronic Dev team has released Absinthe 2.0 which will jailbreak most devices on firmware 5.1.1. I’ll provide a list below of compatible devices. First, I’m going to jailbreak my new iPad (3). It’s current firmware is 5.1 so I am upgrading to 5.1.1. 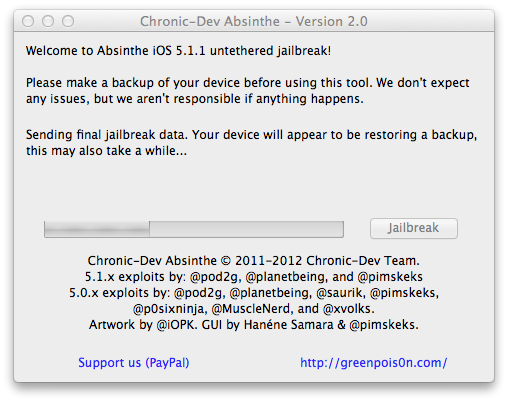 Before jailbreaking I recommend backing up your device. I use iCloud to backup but you can also connect to iTunes and under devices, right click the device and choose backup. It had been suggested to wipe/restore your device before running this jailbreak to save time. It may take up to 30 minutes if you don’t. I have so much on my device that it would take longer than that to restore so I’m trying it with all my apps, pictures and settings. Once backed up you need to download Absinthe to your computer. MacOSX, Windows & Linux are supported. Mine took about 20 minutes. Hey Doug, I got an error (could not connect lockdown) but Cydia was still loaded. Have you heard anything like that? Everything looks fine but I just wanted to see if you or anyone else encountered this problem. Where is the download link? Is it the button that says Download in blue? Please answer quickly! I am totally confused on how to get cydia on my iphone 4. Please tell me how to get cydia for free. which version of jailbreak should i use ….